Paradise Regained is a luxury first-floor condo located just yards from the surf in Depoe Bay. Stroll to the ocean's edge directly from the open deck and enjoy the crashing waves and wildlife. 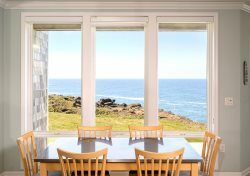 Spot whales, porpoises, sea lions, and pelicans from the living room, dining room, and large oceanfront patio. Curl up and enjoy the waves and the fireplace with a good book and a cup of tea. Take time to appreciate the sights and sounds of the sea while relaxing in this beautiful condo perched on rocky coastline. Spouting whales come into the cove only yards from the private patio. Spacious floor plan perfect for several couples or a lovely family retreat and during your vacation you will understand the name, Paradise Regained. Beautiful tile floors throughout, LCD TV’s in all rooms (4 total), NEW Queen bed in 3rd bedroom, and lovely spa-like tile shower in the master bathroom. Also enjoy the wireless internet, I-pod dock, and HDTV in the living room. Guests of The Village at North Pointe enjoy the beautiful Clubhouse facility with indoor pool, hot tub, workout room, 19-seat theater room and pool table. Blue Pacific have great people working for them. They always make it super easy to make a reservation. If there's a deal they can give you to have you stay longer they will. I love that Blue Pacific makes it so easy to book a vacation it's unbelievable. Super people to work with . . This was our 2nd trip to the area, and we will be back! Great condo, great location!!! Easy to work with, very organized and efficient. This is our family's favorite vacation spot! We saw whales every day and made so many happy memories with our granddaughters! We felt thoroughly spoiled to be able to stay in such a lovely place! It's so clean, we love the art work & decoration. Nice new living room sofas, love the new lights in the kitchen and the new fridge! Beds are comfy, love the shower in master. Lisa was kind, prompt and knowledgeable. A great asset to Blue Pacific! The rainy weather forced us to be inside more than we desired....the condo, however, made the weather moot as we watched the angry ocean from our windows comfortable, warm, dry and cozy!